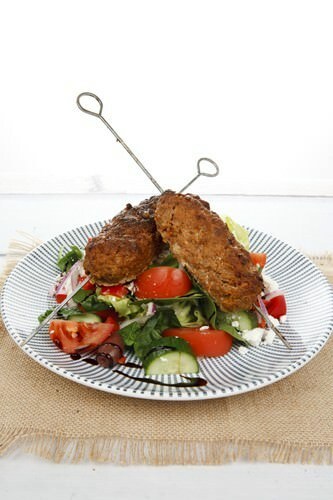 This Lamb Souvlaki & Greek Salad is a deliciously light meal, a traditional recipe straight from Greece. Since I’ve put a few pounds on I have decided I need to share a few recipes that are not so calorific. One of my delicious fallback dishes is this Lamb Souvlaki on Greek Salad. 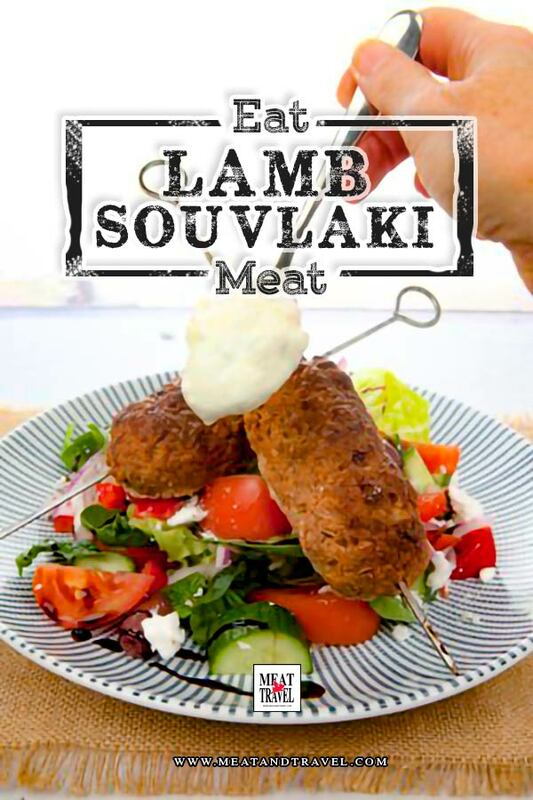 I picked up the recipe when we visited the Townsville Greek Festival. All I needed to do was tweak the salad dressing and cook the souvlaki in the oven, and I had myself a gourmet diet dish. In a bowl add all the meat patty ingredients and mix by hand until well combined. Divide the mince into 12 x 150gm meatballs. Roll each of the meatballs into a sausage shape and push a skewer through the center. 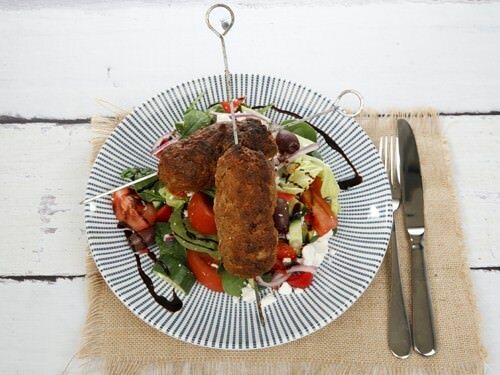 Place the skewer souvlaki on a baking tray lined with baking paper. Cook in the oven for 30mins or until cooked through. Place ingredients on a large serving platter. 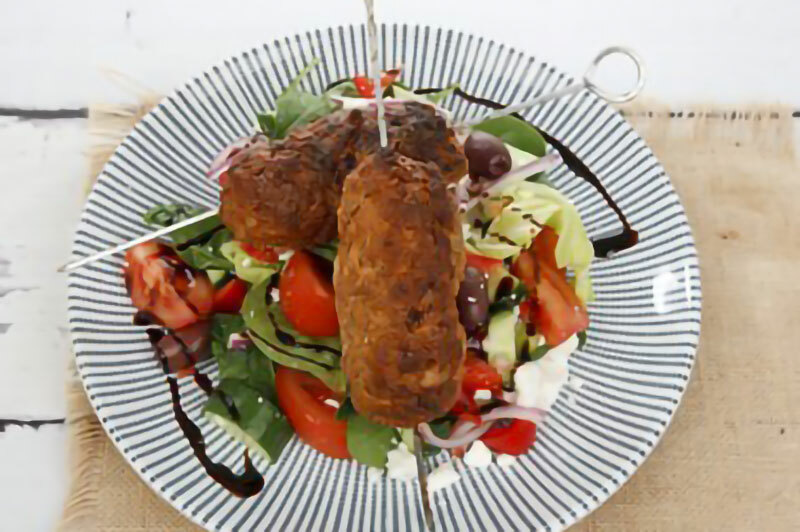 Roll each of the meatballs into a sausage shape and push a skewer through the centre. Baking your Greek Souvlakis in the oven is convenient but the boys prefer to cook them outside on the BBQ. Lamb Souvlaki and Greek Salad ready to eat. If I am particularly hungry, I will used a tortilla bread to make a wrap and add some tzatziki for extra flavour. 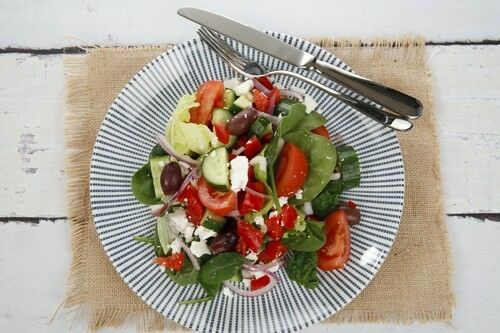 The Greek Salad recipe above will serve four people. Remember it’s a great nutrient burst and tummy filler so “go big” on salad. 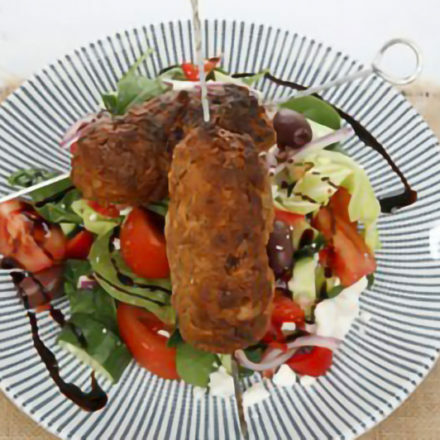 The souvlaki is 150gms each, so according to dietitians, one souvlaki is the correct serving size for a smaller person.